Every year for decades staff members in the Budget Department at Federation worked on voluminous forms and reports as part of the annual campaign of the Greater New York Fund (now known as the United Way of New York City). Unexpected detail often emerges from these budget files, depending on the level of detail necessary to convey an agency’s budget needs for the coming year. I find it curious that the smaller costs (i.e. $96 for the clipping service) are itemized, while the larger costs for furniture repairs and replacements ($7447 for furniture replacements) have no detail other than, “furniture”. Most interesting is that the list of office equipment is so evocative of the era. In the list of office equipment in the budget area “523 Repairs to Movable Equipment” we can see that in active use in The Jewish Family Service office in 1959 were typewriters of course, and adding machines, and also a mimeograph, a postage meter, a safe, an addressograph, an “I.B.M.” (possibly a data processing computer, a number of which were sold by IBM in the 1950s) and something called a “varityper”. According to “The Classic Typewriter Page“, “The Varityper (also known as the Vari-Typer or VariTyper) was a highly ingenious “word processor” of the pre-digital age”, used for typesetting, which was eventually put out of business in the 1970s by the IBM Selectric Composer. 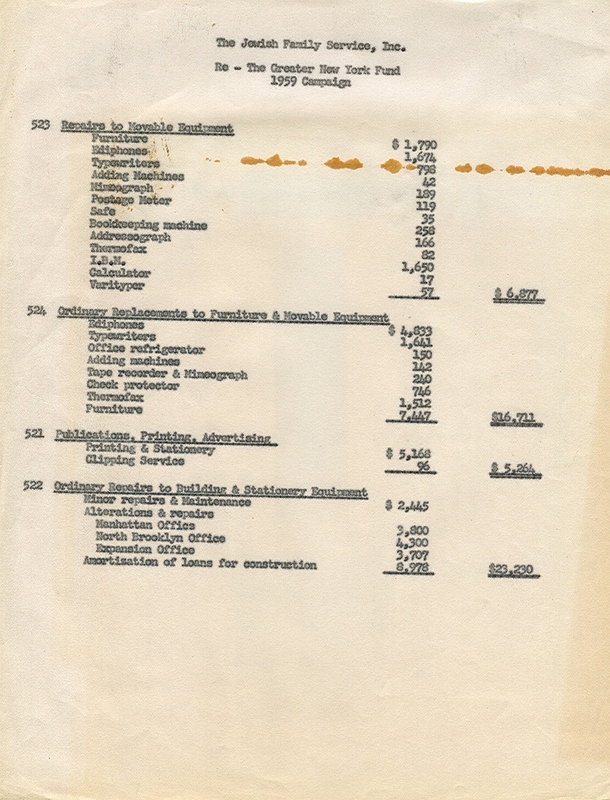 Other than “Alterations & repairs” to offices, the only other budget line item from this sheet that we might see today would be for the cost of a replacement refrigerator. In 1959 the cost was $150; I see a compact refrigerator now on Amazon for $159. It would be difficult to compare any of the other equipment to the costs of running an office today. I would like to end this post by pointing out that the horizontal stain running across the top third of the page is from a rubber band, which, in the 50 or so years it was touching this page dried out, adhered to the paper and left a permanent brown stain. In our last post and also in a post on July 19, 2013, we mentioned Ernest W. Michel, who served as Executive Vice President and Campaign Director of UJA and UFJC for many years. This week we noticed this thoughtful piece in The Jewish Week on his life and work. In the article, Mr. Michel, who turned 90 last month, talks to reporter Gary Rosenblatt about his fading memory. Ironically, having spoken out bravely about his experience as a holocaust survivor again and again, Michel’s life has been dedicated to not forgetting. This is the reason for any archives to exist: so that the memory of one individual or the history of one institution can continue to benefit people long into the future. 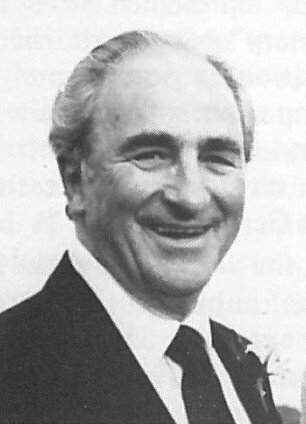 You can listen to Mr. Michel’s expansive conversation about his work at UJA in this oral history that was recorded in 1986. Mr. Michel also donated a collection of his personal papers to the American Jewish Historical Society. This collection can be viewed in person in the reading room of the Center for Jewish History anytime and you can view the finding aid for the collection online here. Recently, in the course of processing some boxes containing correspondence from the late 1960s through the early 1980s within the Ernest W. Michel papers series, I was faced with a style and consistency dilemma. These files hold letters between high-level UJA-Federation Joint Campaign supporters and Michel, who was Executive Vice President and Campaign Director of UJA and UFJC for many years, and the correspondence mostly concerns the subject of fundraising. The folders were filed by the last name of the correspondent, arranged alphabetically. The problem arose in the case of married women. Sometimes the labels on these supporters’ files read something such as “Mrs. 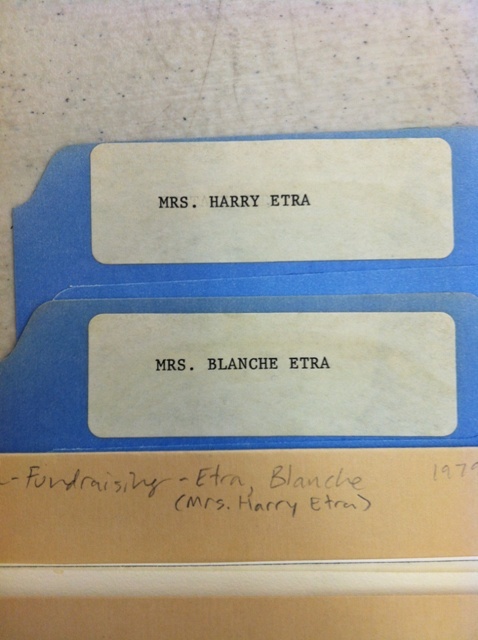 Harry Etra.” Other times they would be labeled “Mrs. Blanche Etra.” In some cases, the woman’s name was simply listed by her own first name followed by a last name, whether or not she was married. In the specific case of Mrs. Etra, there were actually two separate folders, each labeled differently, each holding similar contents. In another married woman’s file there was a short note from Mr. Michel’s administrative assistant, Libby Peppersberg, summarizing a phone call in which the woman had asked to be called by her own first name followed by her married last name only; no husband’s first name and no “Mrs.” Some subsequent correspondence referred to her, nonetheless, as Mrs. Husband’sFirstName MarriedLastName. When processing files labeled with people’s names arranged alphabetically, as this group is, our practice on this project has been to list the name as LastName, FirstName on the folder title. This is how it will also appear within the finding aid for the full collection when it is eventually completed. We strive for consistency and occasionally make minor adjustments to file folder titles towards that end. As a modern person living in the 21st Century, the idea of referring to an adult woman, particularly one who is responsible for her family’s charitable giving, by her husband’s first name, strikes me as a bit odd. It could almost go without saying that men’s names appearing in this subseries were listed on these files without the “Mr.” prefix. I realize, however, that until fairly recently “Mrs. Husband’sFirstName MarriedLastName” was universally considered the most appropriate and, indeed, the most polite form of formal address for a married woman. As archivists, we are often bound to relay language of the time period of the records we are working with, even if it does not completely jibe with modern parlance, since the antiquated terminology itself can convey important information to researchers. My main problem here was how to handle the variety of forms of married women’s names that cropped up in the Michel papers. I needed to determine one “correct” form – the one that reflected best archival practices and was consistent with how we have previously handled it in the collection – if at all possible. Once I had determined that, I would then record all married women’s names in the same way. After some discussion with the rest of the UJA-Fed archival team, it became clear that this problem had not previously come up. We sought outside guidance. The first place I looked was Describing Archives, A Content Standard, 2nd Edition, a.k.a. DACS, the official standards document put out by the Society of American Archivists, which addresses how to describe archival materials. Though DACS does address the issue in the context of creators and the biographical outlines that come at the beginnings of finding aids (sections 2.7.13 and 2.7.14), it does not specify how folder titles for married women ought to appear. Next, I consulted AACR2, the preeminent library cataloging standards document in North America. Similar to DACS, AACR2 does not address this precise situation. AACR2’s chapter 22 concerns “headings for persons,” but goes only so far as to say “terms of address” or titles such as “Mrs.” may be used. In Resource Description and Access, a.k.a. RDA, which is widely regarded to be the next wave of library and archives metadata standards, section 9.19.1.4 grants the option for the ”fuller form of the name,” which could include “Mrs.” And again, RDA 9.19.1.4 pertains to authority records rather than folder titles. The trusty old Strunk & White’s Elements of Style has a short section on names of people, but does not specify how a married woman must be called. I was tempted to consult Emily Post or Miss Manners, but these advice purveyors concern themselves much more with party invitations than with historical documents. In the end, we settled on the moderately liberated and modern form of “MarriedLastName, HerOwnFirstName” with the “Mrs.Husband’sFirst NameMarriedLastName” form following in parentheses, if this form of her name was used at all in the records. In this way, I was able to be consistent throughout all the records, while at the same time, affording the researcher an additional access point. 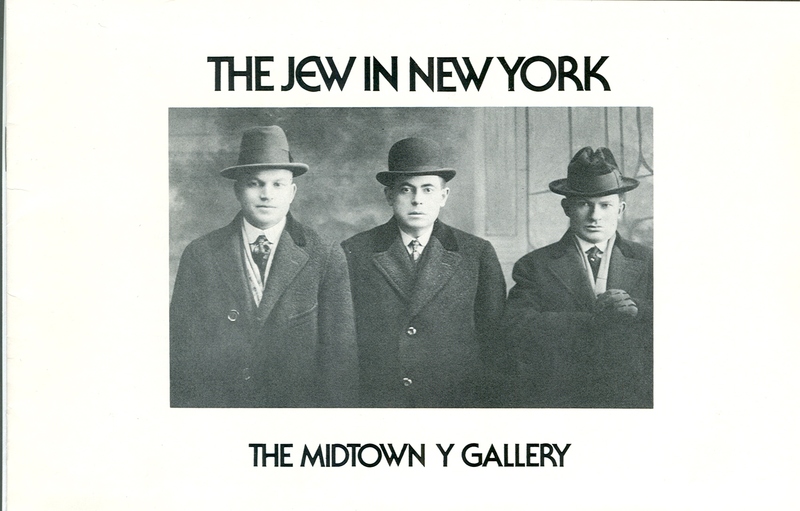 Front cover of booklet for exhibit for “The Jew in New York,” 1973. Found in folder for the Emanu-El Midtown YM-YWHA. The American Jewish Historical Society is listed as a source for exhibit photographs along with the Jewish Museum, Bund Archives of the Jewish Labor Movement, and Hebrew Immigration Aid Society (HIAS). In fact, the photograph used on the cover for the invitation for the preview and accompanying reception to the exhibit at the Emanu-El Midtown YM-YWHA gallery is from the AJHS collection I-7, Graduate School for Jewish Social Work (New York, N.Y.) Records. 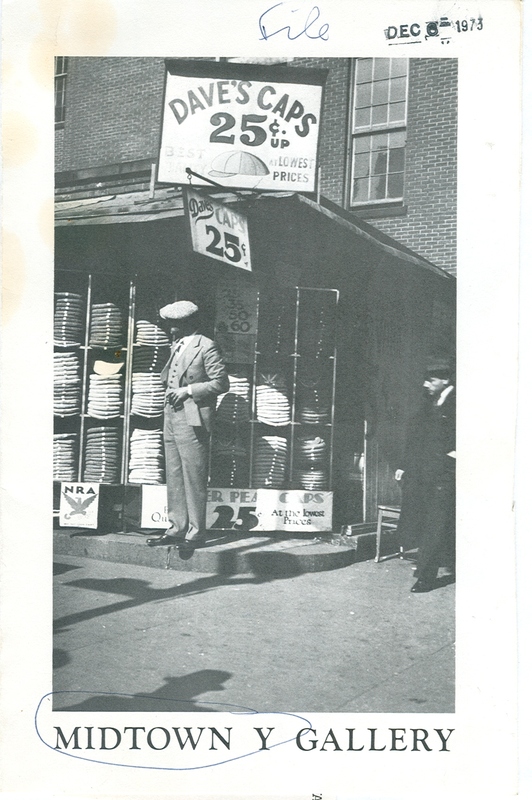 In more recent years, many of the images from the Graduate School for Jewish Social Work’s Lower East Side photographs have been digitized and are available online at the Center for Jewish History Digital Collections. As Harry Golden puts it, New York is “the greatest Jewish city in the world.” Perhaps it might not be too boastful to add that ours is the greatest Jewish city in history, for New York has been for some decades and remains the largest urban community in history… As we celebrate the seventy-fifth anniversary of New York as a united city, it is well to note that the Jewish people have been joint builders in our city’s destiny. This exhibit is a sensitive and moving portrayal of aspects of that Jewish experience. It is another of many fine contributions by the Emanu-El Midtown YM-YWHA to the quality of community life in New York. 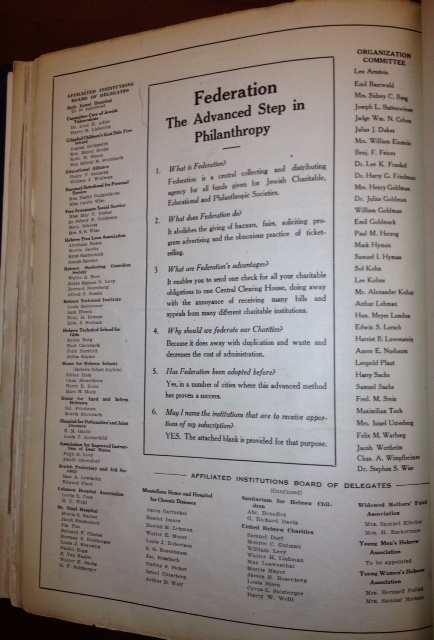 June 6, 1916 – “Plan adopted by the Committee on Federation” for a “Federation for the Support of Jewish Philanthropic Societies of New York City” – from a pamphlet currently housed with governance documents. October 24, 1916 – First use of letterhead in the bound minutes using the name, “Federation for Support of Jewish Philanthropic Societies of New York City.” (This was the name in use until 1944 when NY Federation merged with Brooklyn Federation and became the Federation of Jewish Philanthropies of New York). January 1, 1917 – incorporation date used in 1986 booklet published by Federation of Jewish Philanthropies of New York, just before the merger with United Jewish Appeal of Greater New York. January 8, 1917 – By-Laws of Federation listed, officers elected, found within the minutes of the Board of Trustees. January 29, 1917 – First Board of Trustees meeting. April 27, 1917 – Actual incorporation date of the Federation for the Support of Jewish Philanthropic Societies of New York City, according to the Certificate of Consolidation dated July 31, 1944, when the Federation merged with Brooklyn Federation of Jewish Charities – from pamphlet entitled, “Organization Papers”, 1944, of all NY-Brooklyn merger documents. May 15, 1917 – Date charter became a law, with approval from Governor, passed three-fifths present. Found in the Laws of New York, 1917. Like a very long multiple choice question on a test, which of these dates or events best represents the founding of the Federation? The first board meeting? The charter? The first use of their letterhead? Regardless of which date is selected, UJA-Federation of New York will soon be celebrating its centennial anniversary in 2016…er, perhaps, 1917. An early roster of agencies and institutions participating in the Federation for the Support of Jewish Philanthropic Societies of New York City. We have recently begun processing several hundred boxes in the Community Services Division. This division at Federation was organized into the same Functional Groups as the Budget Department’s files, which have been noted in previous posts. Community Services staff communicated directly with Federation’s agencies, working closely with them on appropriate programming for the agency’s mission, on annual budgets and in long-term planning for future community needs. Some issues that Federation tackled involved professional staff from many of the functional groups – when public policy changes would affect funding for school lunches, for example, community centers and day camps might have to increase funding meals for children. Or changes in Medicare rulings could affect health insurance coverage for agencies and their clients in hospitals as well as in nursing homes. Certain staff members specialized in specific geographic locations – Suffolk County, the Bronx, the Upper West Side of Manhattan, or Greater Coney Island. One initiative in the 1970s was to support or encourage the creation of Jewish Community Councils in neighborhoods throughout Federation’s reach. Federation created a part-time staff position within Community Services, in a department called Community Organization, which handled the Jewish Community Council program (among others). Arnold Eisen filled this role at the same time he held other positions at Federation, including working closely with Community Centers and with the Comprehensive Health Planning Agency (CHPA) program. 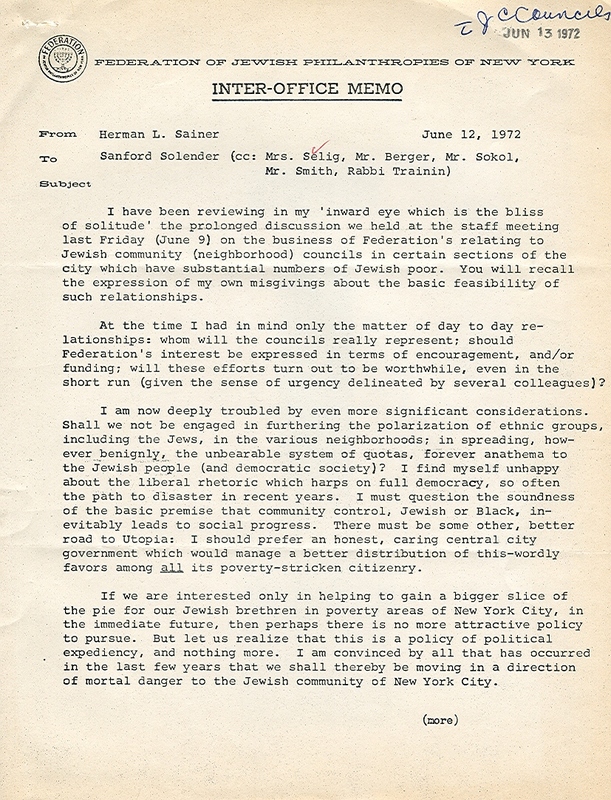 Although it seems that the creation and support of Jewish Community Councils in Jewish communities around New York was a logical area of involvement for Federation, at least one member of the staff, Herman Sainer, had his doubts about the Councils. Herman L. Sainer (1909-2002) had succeeded Graenum Berger as Federation’s Consultant on Camping, serving in that position from 1969 through 1973. Previously, he was the director of Cejwin Camps, established by the Central Jewish Institute in New York City shortly after World War I, in Port Jervis, New York. Federation meetings may have been cacophonous and divisive in order to reach ultimate consensus; from this memo it appears that Herman Sainer may have had a different style, and did his best thinking alone.